Naming conventions for new versions of games are bloody odd. Games that got a luke-warm reception suddenly get Game of the Year versions, digital titles get Collector’s Editions even though there’s unlimited stock, and now, we’ve got Surgeon Simulator: Anniversary Edition, but there’s no anniversary. I guess the A&E pun was too good to pass up. Surgeon Simulator A&E throws slimy eyeballs and rotting teeth at graceless surgeons, which makes the game considerably more grotesque. Give me hearts, lungs, even bowels and the assorted viscera that comes with them, but oh god, teeth and eyeballs. It’s too much for me. As well as the opportunity to fiddle with various cavities, there are new locations for surgeons to ply their trade. Getting elbow-deep into a patient in a surgical theatre is easy, but how about in the back of an ambulance? In a hospital corridor? The game itself has also undergone a spot of surgery, though it’s cosmetic rather than life-saving. 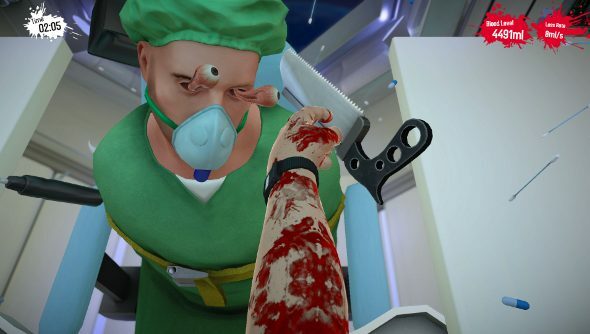 A&E updates Surgeon Simulator’s graphics, making it, apparently, shinier and smoother. If you’ve already got a copy of Surgeon Simulator, you can get the Anniversary Edition content for £1.99/$2.99. If you don’t, the core game and new content will set you back £8.99/$12.99.